Effective change takes time. Deepti shared with us how the Auroville we see today is nothing like it was 45 years ago when the first settlements began. The transformation of a barren near-desert into the verdant and productive village we walk today took years of experiments and passionate effort from peoples of over 50 nations. The change was not immediate and yet you get the sense that it started with the first step towards achieving the vision for Auroville and it is still in process. This same energy that builds on small steps is evident in the other organisations. The first time the Auroville Village Action Group (AVAG) offered loans to its self-help groups, only one group came forward and to take only 500 rupees (€6.50). Anbu, who manages the organisation, recalls the experience with a laugh but at the time it was disheartening. However they persisted with the community, assuring them that the loans would free them from exorbitant money lenders and offering other services for personal and social development. Years later, they are now lending out hundreds of thousands of rupees to over 800 self-help groups. The other key learning reminds me of an over-used African proverb that says it takes a whole village to raise a child. Watching the Auroville entrepreneurial and social support networks, there is every indication that in turn, it takes every child to change a village. The interconnectedness between the organisations, and how they complement each other’s services to serve the community, is outstanding. Krishna, manager of Solitude Farm that is set up to come to a point of agriculture with non-action. 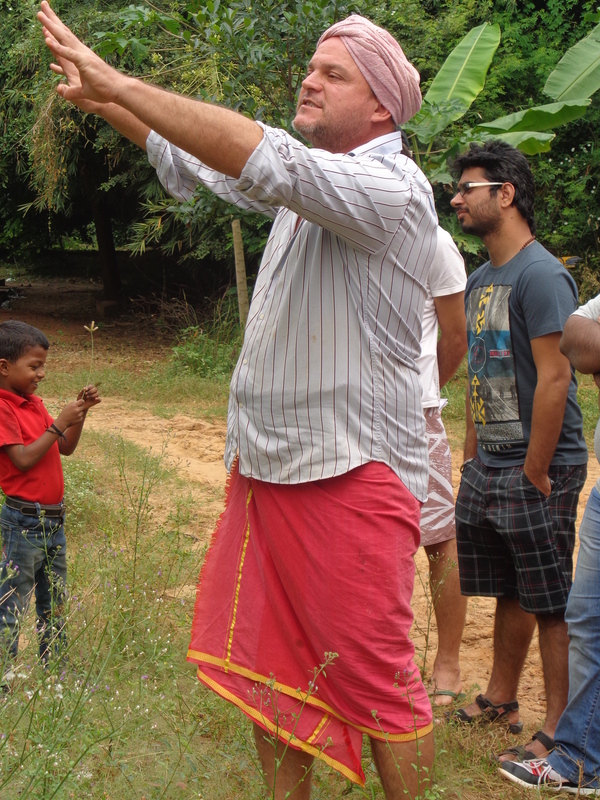 The Auroville Botanical Garden does landscaping work for individuals and organisations in the community and supplies seedlings and seeds to farmers. Solitude Farm gives free meals to children in one school twice a week. Some of the self-help groups of AVAG work at the Bamboo Centre, making bamboo crafts and jewellery. The men’s self-help groups make blocks at the Earth Institute, which supplies building materials for most of the construction in Auroville. Mason & Co (Craftsmen of Chocolate) is consulting with Wasteless to help them design a transportation device with a cooling system. Wasteless in turn consults with Unltd Tamil Nadu that provides business development and mentorship services to the social enterprises. There is no perceptible competition between organisations; each one stems from the passion of an individual to meet a need. And it would seem like once that need is met, there is no need to duplicate that service, instead another organisation forms to meet a different need. A guest I spoke to, who is exploring the possibility of settling in Auroville has already identified the need she would meet if she chose to stay; that of stray, neglected dogs that roam the village. 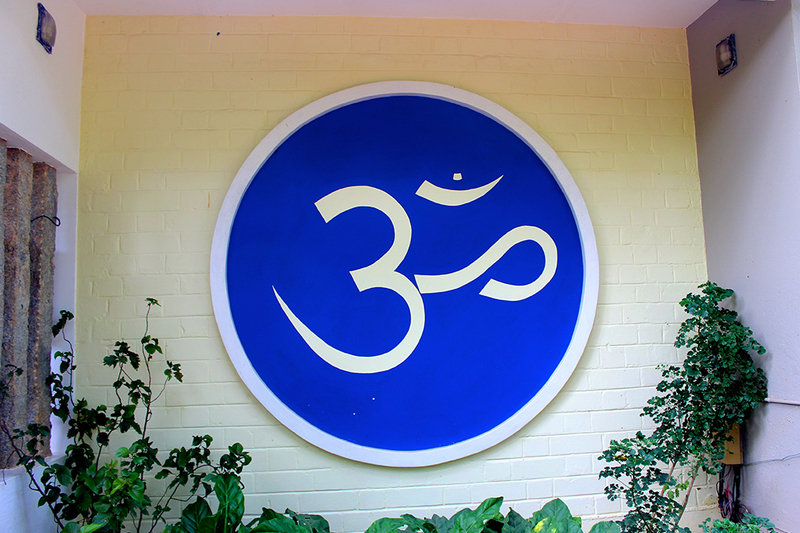 In contrast, none of the organisations outside of Auroville boasted of cooperation with another NGO. Each one is working in seclusion from the others and yet trying to effect change in the same community. 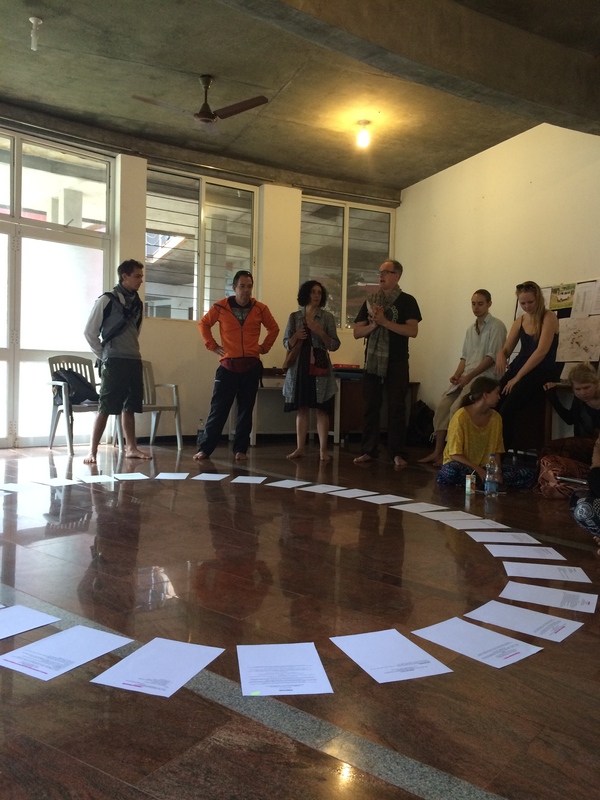 There sure is a lesson to be drawn from the Aurovillian organisations and I wonder if this model to social change can be replicated and scaled up from a commune like Auroville, to a nation or at least a larger community. Today, on the 30th of December we all finally had to decide which organization we wanted to work with. This was, for many reasons, not an easy choice to make. During our first two weeks in India we’ve visited over 30 organizations, which are all working with fundamental and great issues. At every organization we’ve been welcomed with so much love and warmth, that a few of us have shed a tear now and then. The passion of the people in the different organization has been heartfelt and having to choose one cause has been difficult, because so much help is needed. Today, when we all entered the “yoga room”, where we’ve been gathered many times before, one couldn’t help but notice the anxiety that was present this morning. On pieces of paper were written the names of the different organizations that we’ve visited or who have been speaking about their organizations to us. We each had to write our name at 2-3 organizations that we wished to work with according to preference. 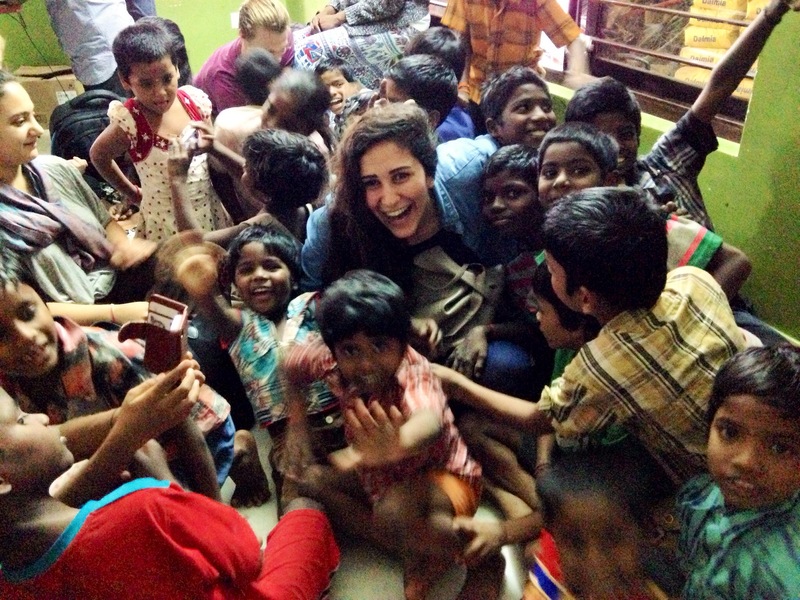 Throughout the first couple of weeks in India we’ve become aware of the struggles that all these NGO’s are facing everyday and we’ve felt their heartache. We’ve become so eager to help, because we’ve seen so much despair, that we’ve almost forgotten the greater purpose with our visit: to aid some of these struggling NGO’s in their fight. And they are all fighting: for education, for money, for more sustainable means of agricultural, for children’s rights, for better health care conditions, for more sustainable energy, for human rights etc. With that in mind everyone left the “yoga room” content and eager to embark upon the third phase of our visit: the phase where we will get the opportunity to help and learn from these astonishing, compassionate and selfless people who are trying to make the world a better place to live. Martina explained to us her strategy for a happy work place for all the women involved. Martina welcomes women to work at her restaurant from any background. In India, there is a very prominent caste system and often people from different castes will refuse to interact with each other. Martina has created a workplace environment that fosters positive interactions between these women despite their differences. Martina promotes group interactions through movie nights, team meetings and other fun activities. Martina also fosters healthy habits in her employees through jump rope workouts during breaks and by teaching about alternatives, such as swapping brown rice for white rice. Martina also talked about the some challenges she faces working with so many women from different backgrounds. She shared with us that just recently several of her employees had been making fun of another employee and despite many conversations about bullying it did not stop. In order to maintain the ideals of a positive working environment, Martina was forced to talk about firing employees until the bullying stopped. Although it might seem harsh, so many women in the local villages are trying to find employment who would be willing to maintain delicate balance of a positive working environment. Martina, being the kind-hearted women she is, informed us that before firing anybody, she would first find them another job with a local business. I was inspired by Martina and her dedication to helping the women of India, while also demanding positive attitudes and respect from her employees. I have worked for several companies in the past and always appreciate a boss who demands respect and unity between all employees in order to make work a positive experience. In addition to learning about the great job Martina is doing with her employees by facilitating a healthy and positive working environment, we also experienced the delicious food at Naturellement. 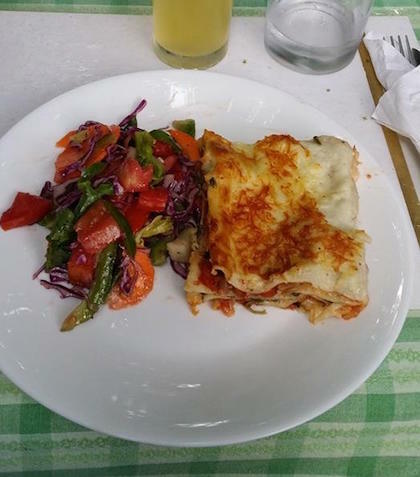 The cheesy vegetable lasagna and salad was ranked by many of the AUP students as one of the best meals we have had so far in India! We sat inside the dim auditorium at the Auroville Town Hall, where we had been fighting our eyelids all morning to stay awake, and prepared ourselves for our next talk. It was about Tamil culture. Actually, we had been anxiously awaiting to attend this particular lecture—to learn about the people whose language we can’t understand, whose culture is so foreign to us, and whose home we are inhabiting for four weeks. We were greeted by Meenakshi, a well-known Tamilian poetess and educator. She stood in front of us, in an earth green Sari (which we later learned is 6 meters long!). Her demeanor is strong yet quiet, and wisdom radiates from within her. In her quiet she commanded attention. At the same time she is humble with kind, thoughtful eyes. “Once there is compassion, problems can be seen in a different light”. As dutiful students, we came equipped with questions: What does the head bobble mean? How do Tamilians deal with conflict? How do they interact with Auroville? Do Tamilians like Auroville? As we asked our questions she turned back to her colleague, who then scribbled something on the palm of his hand. She giggled a little, then digressed. Meenashki spoke to us about the ancient Tamil culture, and the root of its rich traditions. Tamil culture is inherently spiritual, even in the formation of the language. Tamil is not only spoken in India, but it is also spoken in Malaysia, Sri Lanka, and Singapore. The whole language is built from the sound “a” or அ. The vowels are linked with the soul, and the consonants are linked with the body. All Tamil sounds are linked to the energy centers of the body, and like this, they are like living letters. Meenakshi’s friend is chanting the different sounds as she explains the meaning of “sum” (oneness and unity), and I can literally feel the sounds’ vibrations even though he was a generous distance away. Meenashki says, “Nature is our God”, and the giant Banyan tree, which grows from the tiniest seed gives Tamilians faith in God. Like the Banyan tree, whose branches eventually become its roots, we are constantly growing. Meenakshi showed us beads and stone tools, dating back thousands of years to illustrate the antiquity of her culture. The growth of Tamil culture was temporarily stunted by Europeans who colonized their land. Now they work to bridge this gap. Along with a group of Tamilians, Meenakshi realized the Tamil Heritage Centre (THC) in Auroville to help bridge this gap. She says they feel a connection with the Aurovillians, who in a sense worship a “mother goddess” at the Matrimandir, like Tamils do at temples. 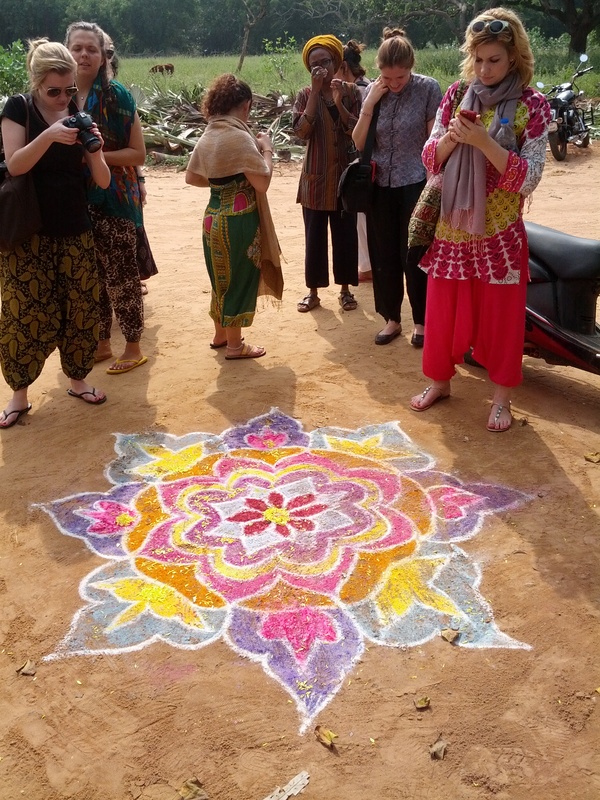 Back on December 22, our visit to the Yatra Arts Foundation began with beautiful kolams as we entered. We watched Yatra Srinivassan’s short film “Maattram” about the dangers of illness and environmental damage from garbage, and heard about other programs that Yatra runs including after school tuition for children to get help with homework. On weekends, children can learn in many arts programs including painting, classical or folk dance, and the Saraswati veena. Four girls gave us a fantastic demonstration of both classical and folk dance. One girl was professional enough to dive off stage to have her skirt fixed and then jumped right back into the dance! 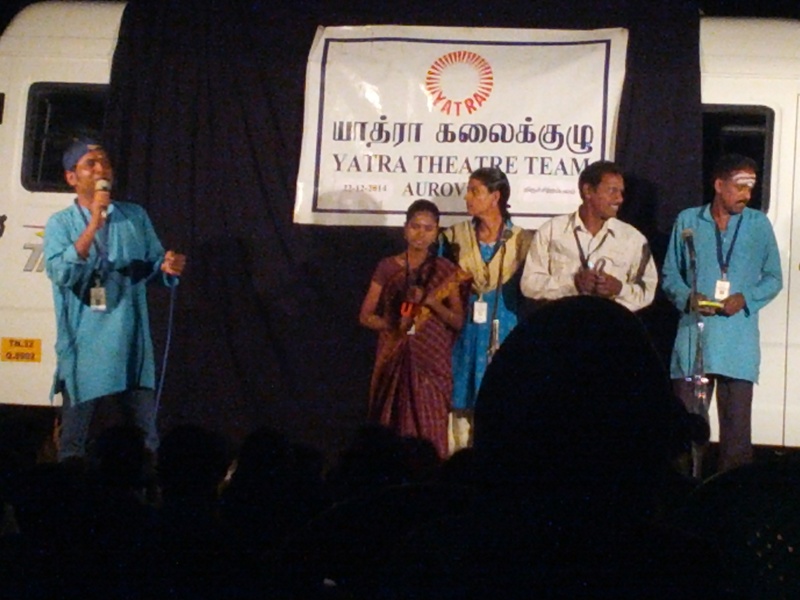 After finishing our scheduled visits for the day, we were invited to visit a village that night to see a street theater performance by Yatra’s company of very talented actors. corner, we found them right away. The lights lighting their stage were simple shop lights. The sound system was an electric drum and effects set, three wired microphones, two speakers, and an amplifier. Their backdrop and backstage was the van they had arrived in, draped with their theatre’s name. It was a simple set up, but very effective – especially if the cheers and responses from the village children were anything to go by. There were musical performances, including dances by some village children, and Yatra helped them discover some dance moves if they were struggling. Some of the women standing with me saw me kind of bobbing along with the children dancing and tried to get me to dance a little more. I did for a little bit, and they laughed. It was interesting to see the women laugh so freely when they had been so reserved when we first arrived. There was an adorable baby girl who played peek-a-boo with me and my pashmina while her mother watched the show. Then came the all Tamil, no subtitled, live version of Maatram. This time, instead of garbage being the culprit it was dirty water. Once the cricketer son appeared on stage and said, “Hi daddy!” and “I have strong body,” the english ended. The kids were laughing and hopefully learning along with their parents and other villagers who wandered into the performance. This short clip, in Tamil with some muttered english translation that is not really necessary to understand, shows the good bacteria in the water and the bad bacteria. Listen for how the children react. As we were leaving, the taxi driver told us we had just left a Dalit village. As I spend the next few weeks here, I am looking forward to learning more about this caste divide and to see how what I saw in that village compares with what I learn.